CHARLOTTESVILLE, VA June 9, 2011 GE Intelligent Platforms today announced the ADEPT3000 miniature rugged automatic video tracker. Easily integrated using standard or custom format carrier cards, saving time, effort and cost and minimizing program risk, it has been optimized to perform real-time detection and tracking across the full range of military and aerospace electro-optical system applications. 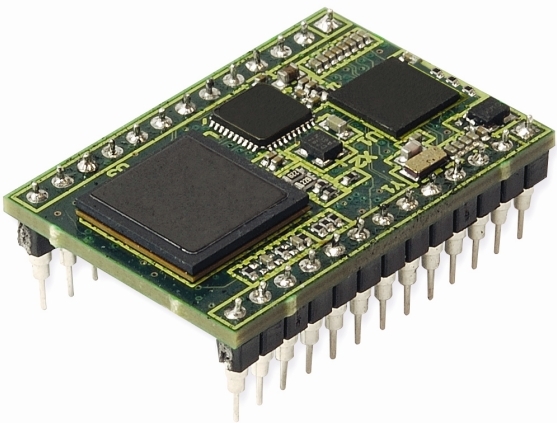 Designed for the detection and surveillance of a moving object, the ADEPT3000 is small (34mm x 24mm – approximately the size of a microprocessor), light weight (around six grams) and consumes minimal power (~1 watt) so that it can be deployed in highly confined spaces such as small unmanned aerial vehicles or man-portable devices, or simply integrated directly into a gimbal. Whether integrated in air-to-ground, ground-to-ground, ground-to-air or naval electro-optical systems, the new improved algorithms at the heart of the ADEPT3000 provide effective detection and tracking. Improved ability to distinguish between an object and the background is accomplished through the use of innovative technologies such as an advanced signature-based pre-processor for rejecting clutter and an automatic tracking engine. “Despite its small size, it is an extraordinarily capable solution with advanced algorithms and significant processing power, allowing the ADEPT3000 to take more decisions itself,” said Jamie Farmer, Business Leader, Applied Image Processing at GE Intelligent Platforms. Determining and tracking an object at longer ranges is aided by a number of features that include improved optics, precision platform dynamics and higher resolution sensors. The ADEPT3000 natively supports standard definition analog video, and once a target has been acquired, advanced pre-processors discriminate it from heavy clutter, mist, dust and other atmospheric challenges. The resulting signal is passed to sophisticated algorithms for track path analysis, opti¬mized for specific operational scenarios.